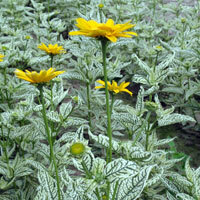 Beautifull pure silver variegated leaves with yellow flowers. Beautiful color combination. Height is 70-80 cm. Strong upside habit. Good for pot culture. Indroduction of Blooms of Bressingham. Is Plant Breeders Rights It blooms all summer. Asks nutritious, well-drained soil and a sunny spot. This outstanding selection forms a tall clump with beet-red stems and green leaves tinged with bronze. 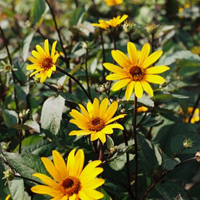 The large single daisy flowers are golden yellow with a contrasting mahogany-red centre, a total colour breakthrough. Outstanding cut flowers. Removing faded flowers regularly will greatly extend the blooming season. May require staking, particularly when grown in very rich garden soil. Easily divided in early spring. Easy and always rewarding. Attractive to butterflies.